I know that when you're a kid all you want is the store-bought Halloween costume or cartoon Valentine cards. I did. But now that I'm all grown up, I appreciate all the hard work my mother did back in the day to make my holidays one-of-a-kind and memorable. So I am continuing the lovingly cruel cycle with no apologies! 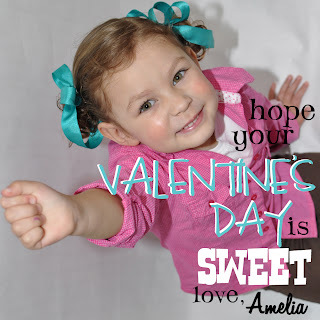 Below are Amelia's Valentine's Day cards which, for the record, beat the pants off every other card in her Valentine mailbox from school. [Mother smiles slyly.] Idea originally came from here. 1. Create a blank backdrop for your photo. Here's how I did it: I pushed a storage tub flush against the refrigerator (to be used as a bench), unrolled several yards of white butcher paper from the local teacher supply store over the tub (held in place by fridge magnets), and have your subject gently sit on your "bench". 2. As the photographer I would suggest standing on a chair to get higher than your subject. Then as they reach for the camera with their fist, you get a good angle. And flood the room with light! 3. Using Photoshop or the like, crop or adjust your photo as desired. I cropped to 4x4-inches. Layer text onto photo. I used colors for the text pulled from the colors in the photo. Save as a jpg. 4. Print your photos. I sent mine to Walgreens (because they always seem to have a special on prints). Call the photo center and give them the final dimensions of the photo that you want. Many of their machines will stretch your image to fit their 4x6-inch photo size, for example, if you do not instruct them otherwise. My photos came back to me as 3.75x3.75-inches, so pretty close to the original size. 5. Trim off excess photo and mount on cardstock. Punch holes near the subject's hand (where you will attach the sweet treat). 6. Attach your treat with twine or ribbon. 7. Sit back and enjoy your accomplishment! And quietly snicker at those who bought their Valentines. Hee hee.